Lady Diana Mayo: Why have you brought me here? Sheik Ahmed Ben Hassan: Are you not woman enough to know? Rudolph Valentino's brief career was fittingly bookended by this pair of desert romances. In the pair, we see from the original how he became a heartthrob, and in the latter, we see him mature in his acting style, becoming impressively more than a pretty face. The Sheik (1921), based on Edith M. Hull's enormously popular proto-bodice-ripper, really made Valentino a household name. Starring as the young French-educated Sheik Ahmed Ben Hassan, he falls for adventurous Lady Diana Mayo (Agnes Ayres) when she disguises herself as a dancing girl to enter the forbidden Casino. When she then decides to venture out into the desert with only a single Arab guide, she is captured by the Sheik and kept as his mistress. Upon her escape, she finds herself at the mercy of bandit Omair (Walter Long) and his gang, who make the Sheik look like a princely gentleman. It's not really a very auspicious beginning for Valentino, who is given to mugging and broadly portraying wide-eyed lust; if it weren't for the dialogue desribing him as European-educated we'd never guess the character had much of any refinement. He does cut a fine figure in his robes and boots, though. Ayres as Lady Diana is passable, and certainly more understated than Valentino. She's more or less credible considering the material that she's given. Adolphe Menjou lends the piece its sole class as the 'man from the west' whose presence in the dunes embarrasses Lady Diana. Lucien Littlefield is a gem as the fussy Gaston, servant to the Sheik. Lady Diana hardly helps our sympathies when she leaves this hapless and relatively innocent character for dead in the desert as she makes her escape. Opulent sets and extensive desert sequences that have much of the impact of the later Lawrence of Arabia really make this piece worthwhile. There are also some intriguing shots with very deep focus as the Sheik rides into a hall of dancing girls. Much less stylized and on a much lower budget, The Son of the Sheik (1926) was Valentino's swan song. He portrays both the title character and father Sheik Ahmed this time out. Young Ahmed falls in love with dancing girl Yasmin (Vilma Banky), without knowing that her father Andre (George Fawcett) is a bandit. When Ahmed meets Yasmin at an assignation, Andre's men capture him and hold him for ransom. Evil Ghabah the Moor (Montague Love) tells Ahmed that Yasmin lured him intentionally, leading to a vicious hatred between them. This suits the disapproving Sheik just fine, but of course true love can't be suppressed by jealous lies, at least not in the movies. Valentino really impresses here, playing both the young and old Ahmed quite well, and giving them different characters without being overbroad or ridiculous. His Sheik is a trifle too vigorous for his advanced age, though. Some effective opticals allow Valentino to share the screen with himself, making for some of the best moments in the picture. Banky is colorless and uninteresting, making Ayres look like a major talent by comparison. The villains are all irredeemably nasty, leading the entire picture to a rather cardboard feeling. Despite the presence of great art director William Cameron Menzies to make some memorable sets, particularly the Café Maure where Yasmin dances, much of the proceeding has a very low-dollar feeling, with precious little desert scenery on view here (and what there is has some suspiciously Californian cacti visible). The middle segment is rather slow, but features a rousing climax that helps make up for everything else. The pair of movies is definitely worthwhile for the contrast in Valentino's talents, and are of course must-sees for any fan of silent film. Image Transfer Review: The Sheik is derived from a nitrate original and carries color tinting that's not so heavy that it eliminates detail. 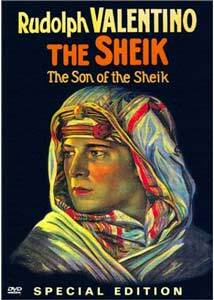 The Son of the Sheik is in plain black and white, from a 1937 re-release print. Both films are surprisingly soft, however. Sometimes this is intentional; Ayres is seldom seen in hard focus, but there are other sequences that just seem unnecessarily hazy. While both prints feature constant scratching, there's not any major frame damage beyond that. The nitrate print is completely free of decomposition. Audio Transfer Review: Eric Beheim's synthesizer score is quite effective, being derived entirely from melodies that would have been popular at the time or classical themes from before 1921. Leaning heavily on Borodin, Delibes and Saint-Saens, it is quite suitable for the action without being unnecessarily obtrusive. As a bonus, the 1937 soundtrack is also provided, but it sounds utterly wretched by comparison to the clean and distinct sound of the Beheim scores. It's limited to historical interest. Extras Review: Three short films are provided as an added bonus. Rudolph Valentino and his 88 American Beauties (12m:49s) is a bizarre publicity stunt dating from 1923. Valentino crossed the country, judging 88 beauty contests, and the winners were brought to New York for the finals, which are provided here. Valentino's tastes are pretty clear since most of the women look identical to each other, making the contest seem ridiculous. Valentino seems completely ill at ease and an unwilling participant. An oddball little film, The Sheik's Physique (3m:18s) features Rudy out for a day at the beach when his car gets stolen; it seems to end abruptly without much closure. Finally, Pathe newsreel footage from Valentino's 1926 funeral (he died 8 days after the premiere of The Son of the Sheik) with numerous celebrities, such as Douglas Fairbanks Sr., on display here. The only other extra is a comprehensive set of music notes by Beheim regarding the pieces chosen. It's interesting for fans of silent music accompaniment, though not free from errors; Beheim completely misdescribes the Rachmaninoff G minor prelude he uses as being an arrangement of the more famous prelude in C-sharp minor, which it most definitely is not. Valentino takes a pair of star turns and we get to see his tremendous progress as an actor over just five short years. The picture quality is adequate and the sound is synthesized but quite good. Some nice extras round out the package well.